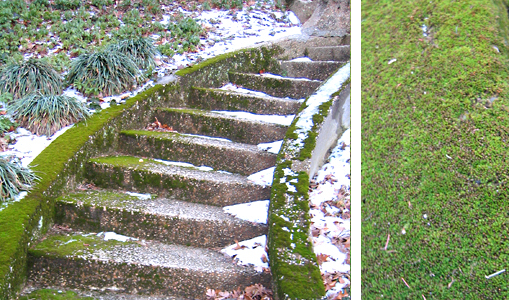 Yesterday I took A&B for a stroll around the neighborhood, despite the chilly weather. We all needed to get the heck out of our little rowhouse cage. On our previous stroll the random spring day a week or so ago, we encountered some great moss and wanted to go back and take some pics. My camera (sometimes referred to as Camera Morte, when it presents ghostly, skewed images) is acting normal recently, so I can take pictures from this world again! I’m a little disappointed, but also relieved, because I don’t really have money to get a new camera. Disappointed because, well, Camera Morte is curious and captures the unknown. Maybe my camera just has two personalities. Split personalities. Kind of the best of both worlds. Luckily I took many pictures when it was on the fritz, so can continue posting them to the CM section of this blog. 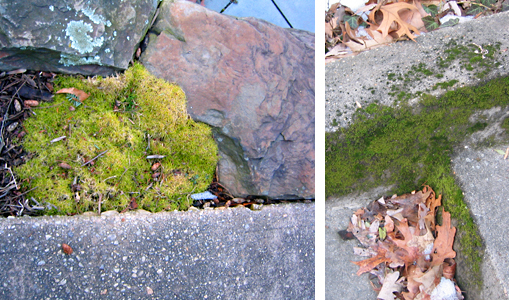 As for these pictures, is Baltimore moss capital of the world?